My first visit to the North was in 1998 when we visited two of our children who were doing research at the Arctic Institute in Kluane. My husband and I immediately developed a deep affection for this incredible land. After teaching Family Studies for over thirty years, I retired to Yukon Territory from Atlantic Canada. Tartan has always been a special part of my life. I grew up in Nova Scotia surrounded by farms, apple orchards, rivers and tartan. Nova Scotia, Cape Breton, Black Watch and Air Force Tartan were all in ample supply. 4H introduced me to sewing. In 1967, I made my first tartan product, a kilt from Canada’s national Maple Leaf Tartan. 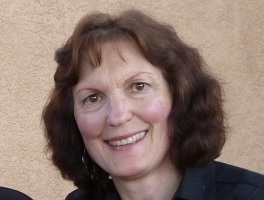 I am a graduate of NS Teachers College and Mt ST Vincent University, have four children and six grandchildren. My husband Dave and I live in Whitehorse. What began as an afternoon’s work to make a few items from Yukon Tartan to send to tartan lovers back in Eastern Canada has grown into a hobby bordering on obsession. My husband compares it to my bread making, like yeast it keeps growing and growing. Photos of some of the items I create can be found in the Yukon Products section. During my search to learn about Yukon Tartan it has been my privilege to met many creative Yukoners, including Janet Couture and Diane Parenti. Janet is to be commended, not only for designing the fabric, but for the nearly twenty years she spent persisting to have it registered as a tartan in Scotland and adopted by the Yukon Legislature. It took nearly another twenty years (Jan, 2014) before Janet and Diane finally met. Diane had used her weaving skills to produce the sample that was finally accepted by Her Majesty’s Registrar in Edinburgh Scotland. Janet Couture is the designer of the tartan; an undertaking that lasted two decades from her conceptual design to its final adoption in 1984 as the official tartan of Yukon. Her vision and expression of the history, colours, flora and majestic beauty of Yukon’s landscape have been woven into the fabric of the tartan. She worked for Murdoch’s Gem shop for a number of years, first as the Store Manager in the Town of Faro, and later as a gold nugget jeweler in their Whitehorse store. After retirement she undertook the design and marketing of a “Yukon” show plate for motor vehicles. Many of these plates can still be seen on vehicles throughout Yukon. In 2007, Janet and her husband were chosen for the honour of Mr. & Mrs. Yukon. At a presentation ceremony in 2012, Janet was the recipient of the Queen Elizabeth 11 Diamond Jubilee Medal in recognition of her design of Yukon’s Tartan. 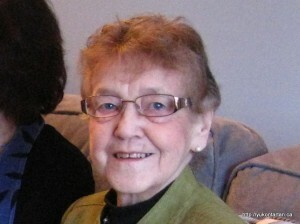 She has three daughters, five grandchildren and twin great grandchildren. 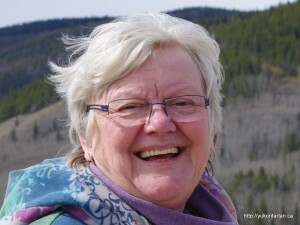 Janet arrived in Yukon in 1954 and has lived in Watson Lake, Faro and Whitehorse. We are deeply saddened by her passing on January 9, 2015. Diane Parenti, an established weaver and long-term Yukon Territory resident has been weaving, spinning, dyeing and knitting for over 35 years. Her interest in Tartan was sparked by her husband’s Scottish heritage, where tartan kilts and accessories are worn at family events. Over the years she has woven many tartan scarves and accessories. In 1984 Diane wove the first Yukon Tartan. The Heritage Branch of the Yukon Government invited Diane to weave a sample of the fabric which had been designed by Janet Couture for submission to the Registry in Scotland. It was officially approved as a tartan and is now a widely recognized emblem of Yukon Territory. Diane currently lives in a lovely rural area where she and husband Rick enjoy small scale farming and Diane continues to weave and spin. They have one daughter who lives in Whitehorse.